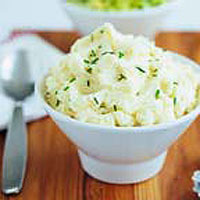 The mildly acidic buttermilk adds a fresh, light flavour to these fluffy mashed potatoes. Alter the flavourings to taste - for example, instead of chives, use freshly grated nutmeg. Cook the potatoes in a large saucepan of boiling water for 20 minutes, or until tender when pierced with a knife. Remove from the heat, drain and cover with a tea towel. Leave to steam for 5 minutes. Using a wooden spoon, beat the warm buttermilk mixture into the potatoes. Season, place in a warmed serving bowl and sprinkle with the chives at the last minute. For the fluffiest textured mash, choose floury potatoes such as King Edward. A mouli-légume or ricer will give the mash the best, lump-free texture.